This book provides an overview of the developments that have taken place with SDI during the past 10–15 years. This white paper provides set-by-step instructions for installing Esri Geoportal Server on an internal Windows server. This white paper provides set-by-step instructions for installing Esri Geoportal Server on an internal Linux server; it shows how a geoportal can be fully implemented using only free and open source software. It requires little to no knowledge of Linux, but it does assume some comfort using computers in general. 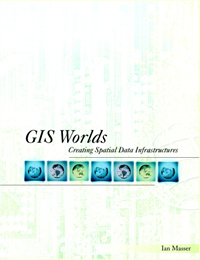 This document describes how Esri GIS software products and solutions align with the Infrastructure for Spatial Information in Europe (INSPIRE) vision for European geospatial information sharing and—more specifically—how they provide a technical foundation for activating that vision. This white paper introduces Esri's approach to the discovery and exchange of geospatial information on the Web and outlines the geospatial portal technology Esri has developed in that context. This white paper describes the level and breadth of management commitment required to install and maintain a Web-based ArcGIS for Server Geoportal extension portal for the discovery and exchange of geospatial information. Marten Hogeweg, Esri's product manager for the ArcGIS for Server Geoportal extension, talks about how the Geoportal extension assists organizations by making geospatial data and services available over the Internet. Eric Van Praag, regional coordinator of the GeoSUR Program, discusses the initiative to integrate and disseminate spatial data throughout South America.